I think about using the blender for making a cake for a week, haha, I'm so obsessed with it. Because I think it will be very easy to make a cake without using much effort and equipment, ^^. So, the recipe that I want to try is the one that you need to mix all the liquid ingredients until smooth. This Hummingbird cake is the first one, hehe. 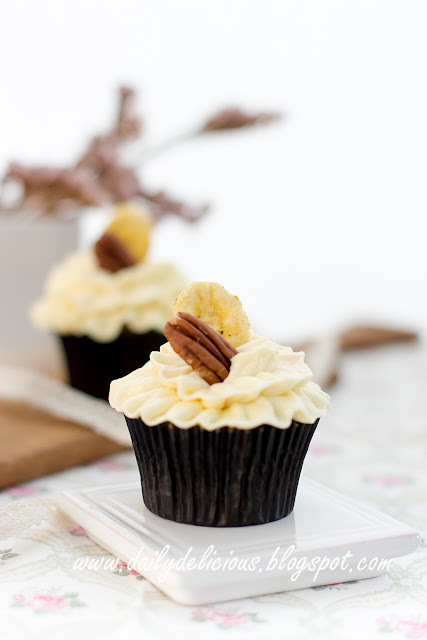 Actually you can add the banana as a chunk but I think puree it into smooth paste make the texture better. So I put all the egg, shortening, brown sugar and banana into the blender and yes, I got smooth paste with moving my whisk. After that you just fold it into a flour, nuts and pineapple chunks, very easy, right?. If you're allergic to dairy product you can enjoy the cake by omitting the frosting, or use the shortening base frosting base instead. 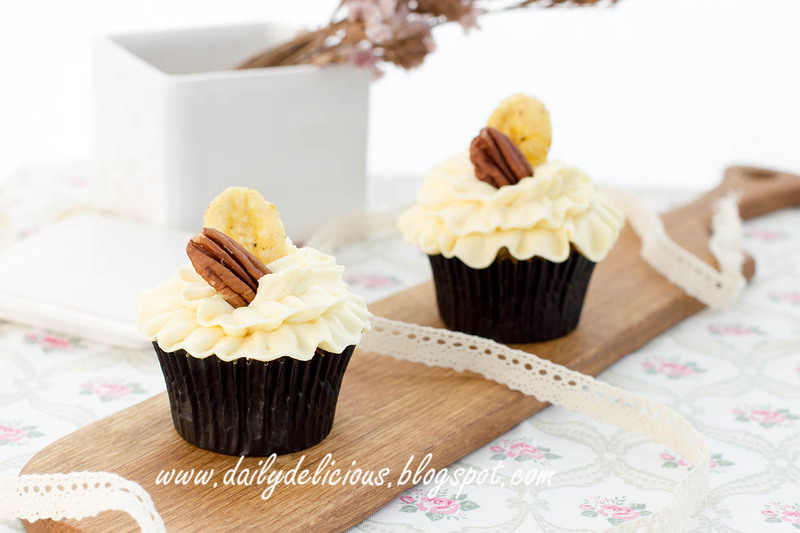 This easy cake has a lot of good thing inside, banana, pineapple and nut (you can use different kinds of nut), give you both energy and fiber ^^. Serve it with a cup of tea is the best but I let you decide, haha. 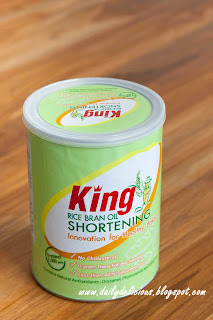 I use this Shortening (non-hydrogenated rice bran oil shortening). Line 8 cupcake tins with baking cups. Sift the flour, baking powder, baking soda, cinnamon powder and salt together. Put the shortening, brown sugar, egg and banana into a bowl of blender or food processor, blend or process until smooth. 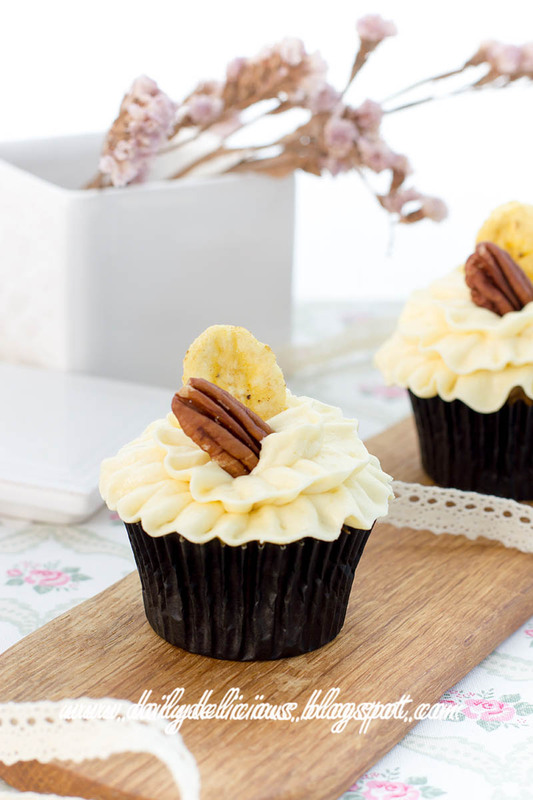 Pour the flour mixture, pecan nuts and chopped pineapple into a bowl, and pour the egg and banana mixture into the bowl with vanilla extract. Divide between the prepared cups. Bake for 18-20 minutes or until the toothpick insert into the center come out clean. Put the cream cheese and butter into a bowl, beat until smooth. Pour the icing sugar and vanilla extract into the bowl, beat until smooth. 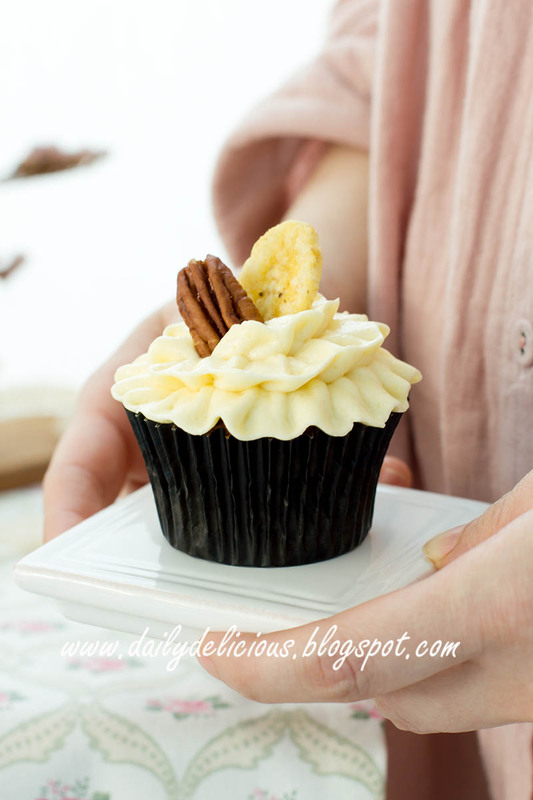 Put the frosting into a piping bag, (I use large rose petal tip). Decorate as you wish ^^.